We&apos;ve all looked at an especially high—or especially low—stat and wondered, "What happened there?" 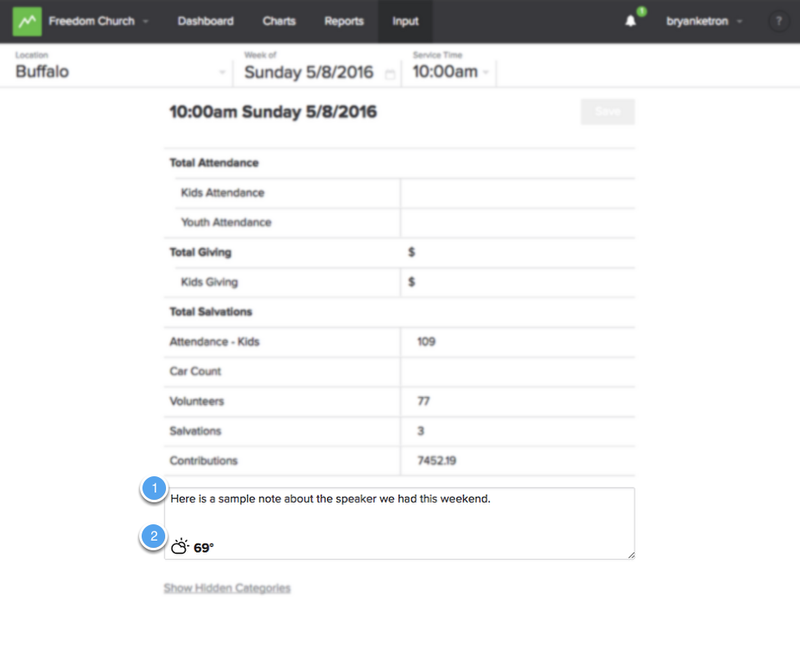 By adding notes to your service times, you can better understand trends in your data and provide important clarity for all the people in your ministry who review data. Once you have selected the service time you want to enter data for, scroll to the "Notes" area at the bottom of the input page. In the notes area you can add any information that&apos;s pertinent to that weekend. Things like guest speaker name, special events like child dedications or baptisms, a snow storm, a mission drive, etc. Additionally, a weather icon will be automatically added if you&apos;ve set up the weather integration. Learn how to do that in our Weather documentation.